When you get to the shopping stage of having a baby it can be quite overwhelming. I have read so many reviews I am not sure what to go for in some aspects. However there are some items that I most definitely want to buy, products that I feel will help my husband and I overall when our baby does arrive. Considering I’m such an organised person there are still a few things that we don’t have for baby as yet. The reason being is that we were researching and comparing brands in some product cases, and some things we just couldn’t make up our mind on. You often get told to buy things that are actually quite unnecessary, however there are also things that both fellow parents and bloggers have recommended to me. I’ve then done my own research and also attended demonstrations at baby shows in order to help make my decisions. My plan is to review each of the main items that we do purchase, I can only do that once baby is here though and we are actually using them. So today, I want to outline my current wish list and the items I’ve considered getting. Some things that we have in fact bought, will be reviewed in time. 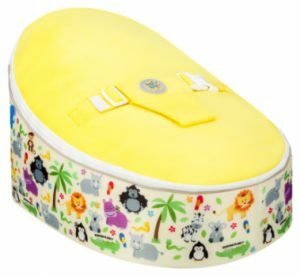 In the next few paragraphs I’m going to be explaining why I want these particular products for baby and the reasons that others have given me for buying the item which has sparked my interest in the first place. I have been introduced to Belo Teething Mitts recently via Facebook when a friend shared their recent competition. I liked the style of them, although they aren’t as popular as some brands they seemed quite affordable and peoples reviews reflected a good quality. Once baby is born I would consider ordering a pair of these mittens especially if our baby begins to chew their hand or digits for example. These Belo Mittens are available for babies aged 3-12 months. They are BPA Free and Safety Tested, they can also be washed in the washing machine. Here is an image of their mittens, they are only available in blue or pink at the moment. 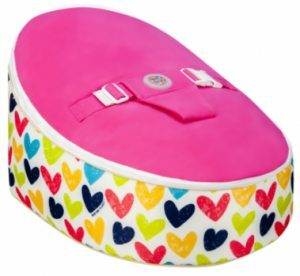 One thing I have been looking at for months has been the baby bean bags available on the market. 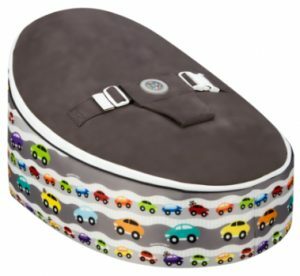 My husband and I bought a Poddle Pod already from a baby show. But I like the look of the bean bag because baby will grow with it. Here are the main reasons why I would love to buy our baby one of these. 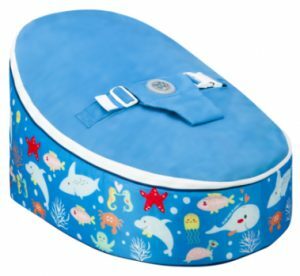 The product has two covers, one for newborns with a harness and the other one is suitable from toddler to ten years old. The bean bag base is waterproof and wipe clean. Not only is the inner product fire retardant but the bean bag also features a removable and adjustable filling. Here are some photographic examples of the sorts of styles that Bean Bag Planet currently do. It also costs an additional £3.99 to have the bean bag filled. Another Mitten that I have seen and like the look of is the Gummee Glove. This baby mitten has teething sections attached and they make several sizes for different babies stages. I would love to invest in the first one which is for 3-6 months, and if baby gets on with it I can get the next size up. The reason I like the look of this teething mitten is because they are made with 100% cotton. It is BPA, Latex and Phthalate Free, Safety Tested and Machine Washable. Gummee Glove currently comes in three colours, Yellow, Turquoise or Pink. Here are some images of the Gloves currently available and I have included a link to the website too for anyone who wants to see it. It’s taken a while but we’ve finally began to order things for our baby. We’ve decided to make some changes at home, getting rid of things to make room for new items such as furniture. We have removed a wardrobe so that we can have a baby changing table with storage shelving that will be ideal for us to store nappies and things in. Something else that we have done is rearranged our bedroom so that when baby is here the Moses basket won’t be against any external walls. It’s important to read up about the safety aspects of your home, and make sure you have taken any precautions or rearranged furniture so the room is well ventilated for example. Other preparations that we still have to make are more tidying and putting away of items that may create allergen risks. It also means I will have less to do when baby is here, such as making hoovering easier and dusting time less – neither of which are bad things! We hope that in these final few weeks we will still have the time to complete the rooms exactly how we want them, before baby makes its appearance. I will be reviewing items we have been particularly impressed with individually on the blog, as and when I have time to. So stay tuned to Severn Wishes in the coming months if you’re interested in any of that! Thanks for reading everyone! Do you own any of these products? Please let me know what they’re like in the comments section if you do! This entry was posted in Baby, Furniture, Gummee Glove, Health, Home Sweet Home, Homeware, Lifestyle, Maternity, Pregnancy, Shopping, Toys, Wishlist by Sabrina. Bookmark the permalink.